The butcher shops here in Germany, actually, from what I have seen, in Europe in general, are not for the faint of heart. There are animal parts in the display case at my local butcher which I have yet to identify and am too afraid to ask about. It appears that nothing goes to waste. 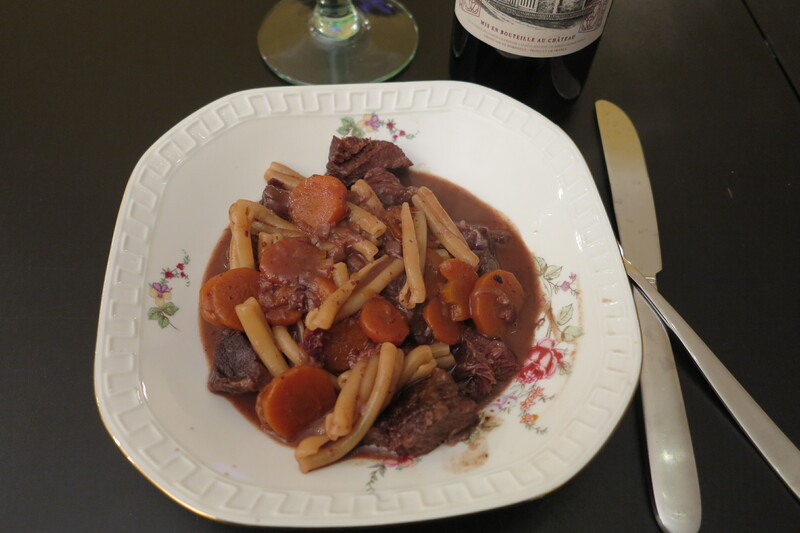 For this reason, I felt fairly confident when I set out to shop for this week’s French Friday’s with Dorie recipe, Beef Cheek Daube, that I would be able to find the title ingredient. Luckily though, I also took Dorie’s advice and asked my butcher about beef cheeks early in the month. I was told that they do have beef cheeks, but that you have to arrive very early in the morning because they tend to sell out quickly. Well, those who know me well know that I don’t do anything early in the morning unless I absolutely have to. So instead I ordered my beef cheeks in advance (had to pay for them in advance too!) and happily slept in. 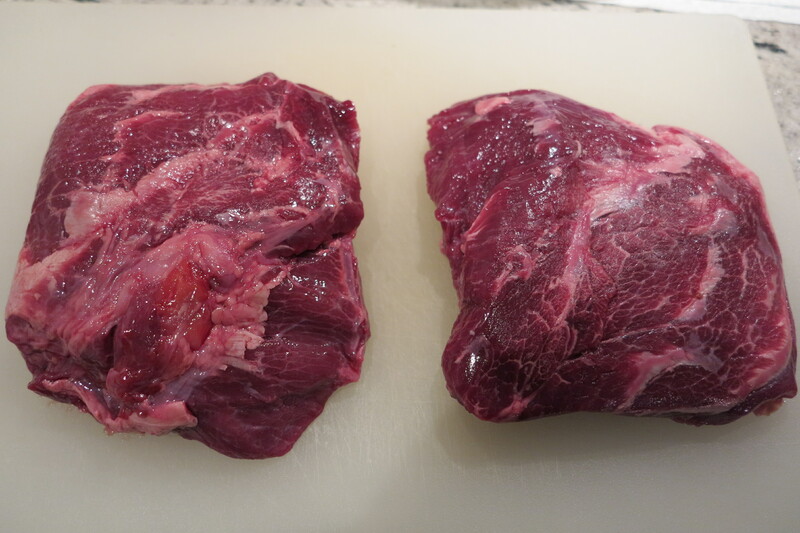 For anyone who wasn’t able to track down beef cheeks, this is what they looked like. Maybe now is the time to mention that I don’t even like beef stew. Never have. It’s weird, I know, but I guess we all have our issues. I basically made this for my husband. You’re welcome schatz. In fact though, this beef stew wasn’t all bad, I actually liked the sauce, and the pasta, and the carrots. I loved the wine I served it with. Pretty much everything except for the meat. Yes, it’s official, I’m weird. I can live with that. And apparently so can my husband because it meant more stew for him. This entry was posted in french fridays with dorie, life in germany and tagged Around my French Table, beef, main course, seasonal - winter. Bookmark the permalink. Wow! I wonder if anyone else was able snag cheeks? I didn’t even try. I’m impressed! I could have found cheeks had I had time but I used stewing beef instead. Great flavours!! I think you may win the prize for sourcing the key ingredient this week. Bravo! Kudos for ordering the cheeks in advance. I skipped this one, so I’ll have to remember the trick for next time! Rose, You are the first one that I visited, who found beef cheeks…I would have asked how it compared with chuck roast, but since you didn’t eat it…I’ll have to just wonder…lol! Your daube looks wonderful…pretty dishes! Rose, so glad that you found those “Rinderbäckchen” too – not only did my butcher happily order them for me and ordered twice the quantity that I had asked for but he also asked for Dorie´s recipe – so, this was a fun week with a fun recipe! Having said that, your Beef Cheek Daube looks wonderful, so nicely done and lovingly presented! Schönes Wochenende – Have a great weekend! actually, I think I would happily just eat the pasta with the sauce.. it was pretty darn tasty!! Certainly not one that I would skimp on – I even added extra bacon to mine! Jealous of your beef cheeks! They are not to found in Oklahoma City! I’m not crazy about the meat either. It i love the rest of it. Nice pictures and thanks for showing us what cheeks look like. I feel the same as you about beef stew. I found the sauce in this recipe was exceptional. I wonder if I could just make the recipe without the beef and the sauce would come out the same. I’m envious that you scored beef cheeks. I would have liked to try them. Your daube looks delicious! I’m afraid you can’t have the sauce if you don’t use the meat as it requires the fat (and gelatinous bits if you got the cheeks). I now REALLY want to find some cheeks and have this again soon. Wow, you did it! My vision of beef cheeks was something long and stringy, but they don’t look too bad…however…I don’t think they’d make it into my mouth. My favorite part was the pasta and sauce…I ate some bites of roast, and it is good, however, I’m moving on to cookies. Love your post and it is good to hear from you. The sauce was really exceptional! But if you are not a big meat fun then beef cheeks can be a bit overwhelming. At least we had the wine and the chocolate to make this recipe really one of a kind! table. Ugh! Your dish looks great, happy that you could find the beef cheeks, good for you.